The fruit for this wine was picked at 25.0° Brix and a pH of 3.60. The structure was developed using a time consuming, but specific De Angelis Wines fermentation program. Three different yeasts were used in three separate fermentations. Each fermentation was individually monitored, and completed. Each yeast contributes specific characteristics to the blend. One yeast promotes the development of intense fore mouth and mid-palate sensation, another ripe fruit and jam so enjoyed by many wine drinkers, as well as a great mid-palate mouth feel. The third yeast, promotes mid-palate and intense tannin sensations as well as a long finish and concentrated flavors. Once fermentation was complete, the wines were blended, then racked to barrels. The 2007 Pinot Noir remained in French oak barrels for ten months, and was allowed to complete secondary – Malolactic – fermentation in the barrels. The wine was gently fined, racked, coarse filtered and bottled in July, 2007. This wine is a 14.35 % alcohol wine that is a fruit forward wine, offering a hint of oak, and a bit of spice. Fruit flavor such as cherries, and blackberries coupled to a great mouthfeel, and very soft tannins make this an easy to drink Pinot Noir. 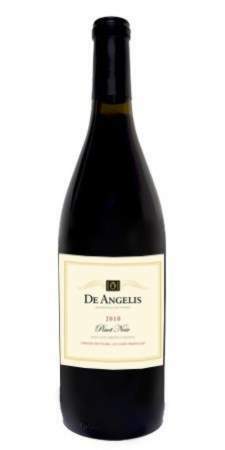 De Angelis Wines released this now Library Pinot Noir in July of 2011. We sourced the fruit for this Library Pinot Noir from both warm and cool weather vineyards. The resultant wine is a 14.1% alcohol, classic Pinot Noir, that exhibits a terrific mouthfeel, a long finish, and fruit both on the nose, and in the mouth. Combining the best fruit from two regions demonstrates that the best wine is made from great fruit grown in two micro-climates. We fermented this wine using a number of different yeasts. This practice allows us to titrate flavors, and other organoleptic qualities of the wine we make. Once barreled, we aged the wine in both Hungarian and French oak barrels for 14 months, to develop slowly. We bottled this Pinot Noir in mid-February, 2011. Further aging occurred for an additional 12 months in bottle before its release in 2011. 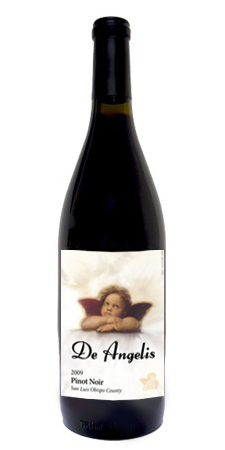 As can be seen from the bottle shot to the left, this wine sports our original cherub label. From the time this wine was in barrel, it was clear that this wine would be a great De Angelis Wines Pinot Noir. Barrel tasting throughout aging was very exciting and rewarding . While young by our standards when released, this Pinot Noir is as good now as a Pinot Noir should be! As the years between 2009 and 2017 continue onward, this Library Pinot Noir acts as a symbol of just how long a well made wine can continue to improve. Obviously proper storage conditions must be maintained to expect a wine to be as good, or better, than it was when initially released in 2011. There is very little of this wine left in our Library. It is, and it is still one of De Angelis Wines best sellers! Try a six pack. The 2010 Pinot Noir was made from a relatively large lot of fine, cool weather fruit from Cerro Prieto Vineyards on the West Site of Paso Robles California. A smaller lot of Pinot Noir grapes was sourced from fruit grown in the Templeton Gap area – a quite prestigious wine growing area also in Paso Robles. This combination of different fruits grown in two different regions of Paso Robles resulted in a wine with great balance. The fruit was vinified using three different yeasts in three separate fermentations carried out on each lot. Each yeast contributed different organoleptic properties to each lot. All three lots were blended together after fermentation. This additional effort and care resulted in the crisp, fruit forward and balanced wine described below. One objective of using cool weather fruit is to add acidity to the blend, and to do so as naturally as possible. Soft tannins and long chain poly-phenols are contributed by the warm weather fruit. This wine was aged in a combination of Hungarian and French oak barrels for 18 months, and was allowed to develop slowly in barrel. It was bottled in mid-May, 2012, and subsequently allowed to bottle age for an additional 20 months. A very limited release of this wine was done on Memorial Day, 2013. A further release occurred in October of 2013, with full release in January of 2014. From the time this wine was in barrel, it was clear that this wine would be a very fine representation of a De Angelis Wines Pinot Noir. We have paired it with many different dishes as we allowed it to age. It stands up to aggressively seasoned foods, as well as those not so strongly seasoned.